About a year ago I met a lovely lady at Max's AFL club (Australian football league). We had just moved into our new neighbourhood and was on the look out for like minded people. I have to admit I didn't have much luck with group gatherings. I wasn't sure it if was due to the fact that I hadn't been back long in Australia or if it was me entirely who didn't fit into theses somewhat clicky groups? To tell you the truth, I am still not sure, however, each week we turn up and watch Max play the game he loves and each week I wonder if I'll ever fit in? A year ago I met Natalie. She looked like someone who liked a bit of a chat...so I chatted. We hit it off, made plans to see each other socially, however, it never eventuated. I was always working, she had things going on in her life etc, etc. It wasn't until the second year of our kids playing footy that we finally sat down and made a proper date to do lunch. This date was today. It was decided last week that we would get together after footy and have lunch, catch up and open a bottle of vino. This weekend also happened to fall on a long weekend and a rainy weekend at that. The day was planned, after footy we were to go around to Nat's (thankfully she only lived up the road) and I would cook a paella. 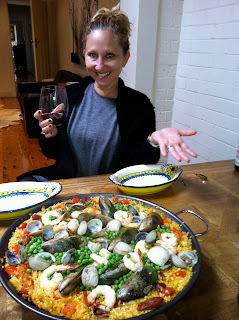 I know she invited us over to her place but me being me I wanted to cook and had paella on the brain. It didn't take much to convince Nat that it was a good idea for us to come over and let me cook. I was excited, I had just found a fabulous local deli that sold traditional Spanish paella rice (bomba), paprika and chorizo sausage. All I needed to do was take a trip down to the fish markets and buy the rest of the ingredients for a feast. The boys blitzed their footy match while it poured with rain (rain seems to help them?). I couldn't think of anything better than sitting through the rest of the day slowly sipping on a glass of Shiraz while cooking paella and talking with friends. I made myself comfortable in Natalie's kitchen while I cooked lunch. Even though it took a little longer than I thought (shouldn't of had a glass of wine first!) the end result was fantastic!! When cooking a paella, you really need to go as traditional as possible. I bought authentic rice, chorizo and paprika which made the whole process that much easier. Seeing as I wanted a seafood paella, I made my own prawn stock the night before. I peeled about 250 grams of prawns, sauteed the heads and shells, poured in about a litre of water with a teaspoon of salt and then simmered it for 30 minutes before straining. We weren't sure how the boys would react to paella seeing as it was a first for all the boys. I am happy to report they were just as excited as the adults. 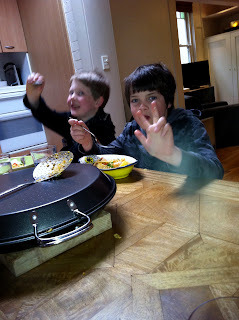 As we found out, it was a great way to introduce them to pippi's and mussels. They were excited by the shells and eagerly slurped down the pippis and just so happened to like them! A wonderful afternoon was had, great food and wine was consumed and I am happy to report a wonderful friendship has blossomed, it's just a pity it took a year to finally organize. Thanks Nat and Baz and we look forward to another lazy Sunday afternoon! Get out your 40cm paella pan and add oil on a medium high heat. Add onions, saute for 1-2 minutes then add garlic, red capsicum, salt and pepper and saute for 3-4 minutes. Add saffron and paprika, saute for 3-4 minutes then add calamari rings and chorizo slices. Cook until calamari turns white and sausage smells fantastic! Add stock and bring to the boil. Once simmering shake in the rice and cover completely with liquid. Add tomatoes, shake to cover (DO NOT STIR). When paella is boiling, reduce to a light simmer and leave for 20 minutes, giving the pan a shake every 5 minutes to make sure even cooking. After twenty minutes, add mussels, pippis, prawns and peas. There is no need to stir in, just cover with a lid (or another paella pan) and continue to cook for 5 minutes or until mussels open. Remove lid, check that all liquid has been absorbed, if there is a little remaining, turn up the heat and cook for a further 2-3 minutes. Note: You should have a lovely crust on the bottom of your pan and that is what you want. The rice caramelises, this only happened on one side of my dish, I think I needed a bigger burner but it was still a fantastic flavour. That looks AWESOME! Oh my God what a great Paella! It sounds like you had a nice day spent with a friend. I haven't made a true paella yet, but it is on the list. Thanks Susie, pippis are a mini version of clams.. They have the same shell but are tiny. You'll have to get out your paella dishes and break them in, it is a fabulous family Sunday lunch with very little time spent on cooking- I can post the recipe if you like? Bryan- Thank you, I am sure you will also love it once you make your first and your new grill with the burner on the side is PERFECT!! yes please...we sell the rice at Williams Sonoma, and I have a good place for chorizo...may have to sub the pippis, not much fresh shellfish on the Mississippi! But mussels for sure. Thanks, I'll let you know how it turns out. You can come down here and cook that any time Camilla!